One of Britain’s oldest and most distinguished charities, the RSPCA (Royal Society for the Prevention of Cruelty to Animals), which specialises in the promotion of animal welfare, have commissioned Diverse Ethics to help them engage with various faith communities. Mr. Gavin Grant, the Chief Executive, understands very well the huge importance of faith communities in Britain and is keen to work with them to promote care and compassion. In choosing the engagement approach, Diverse Ethics placed creativity at the very heart of the formula. We launched this initiative in September 2012 at the outstanding Jain temple in London during their Paryushan festival of Jiv Daya (compassion for all life), a short report and film of which you can view here. At this event, leaders from the RSPCA were very open to learning and engagement, and built a unique relationship with the community through humility and respect. 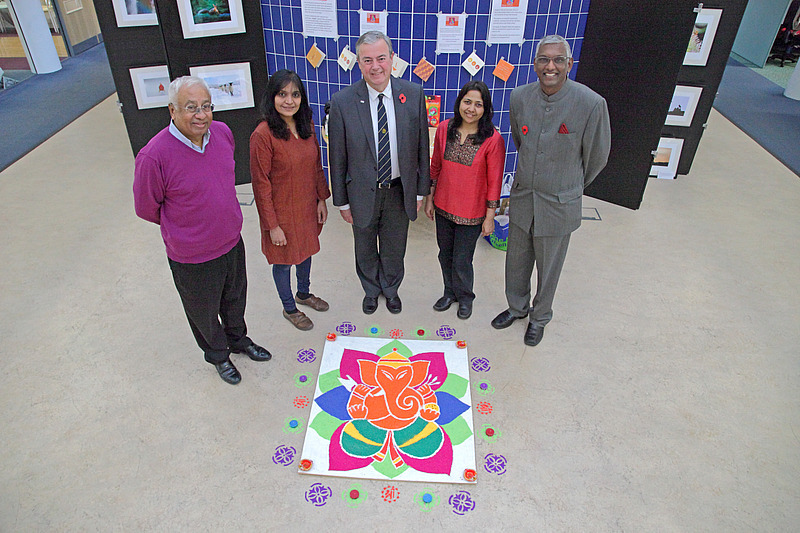 For the next phase of the project, RSPCA leaders attended the Hindu Navratri dance festival at the Crawley GHU Hindu Temple and then celebrated the Diwali festival at their headquarters in Crawley. Mr. Ashwin Soni, a trustee from the Temple cooperated fully in this project, helping with the RSPCA engagement with significant warmth, professionalism and hospitality. A stunning ‘Rangoli floor painting’ was commissioned depicting the Elephant God Ganesha, and two talented artists from the local community, Binita and Chetana, created the artwork. I explained that even though the Rangoli will be swept away after a few days, Hindus see their whole life as an offering where the joy comes from giving and sharing and beautifying the planet, with a minimum of harm and a maximum of good. Detachment from the fruits of the actions is the hallmark of a true Hindu – and there is joy in living compassionately and charitably. The wonderful animal welfare work of the RSPCA is to be applauded for its selflessness and respect for those who are voiceless and harmless and who show unconditional love and compassion. A special reception was held with Council members and local dignitaries to mark the occasion. 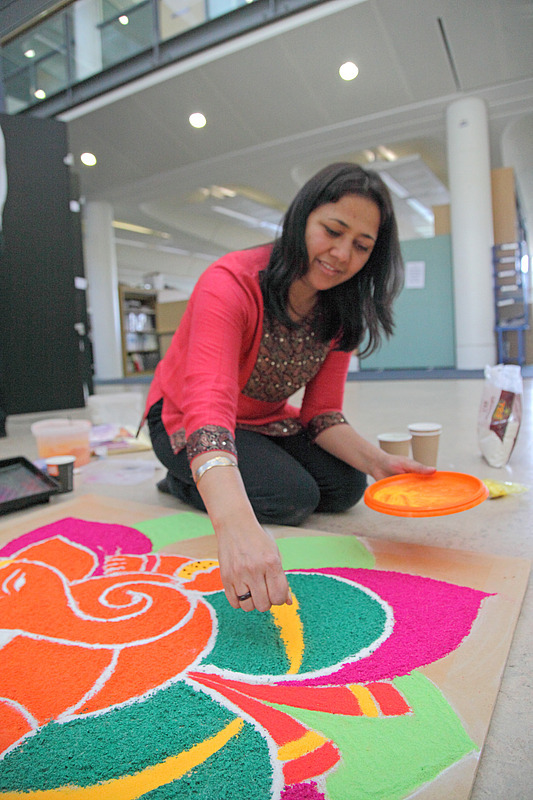 The impact of the Rangoli on the staff was truly mesmerising, and it made them reflect on the joy of diversity, and the advantage of learning from different cultures and faiths. 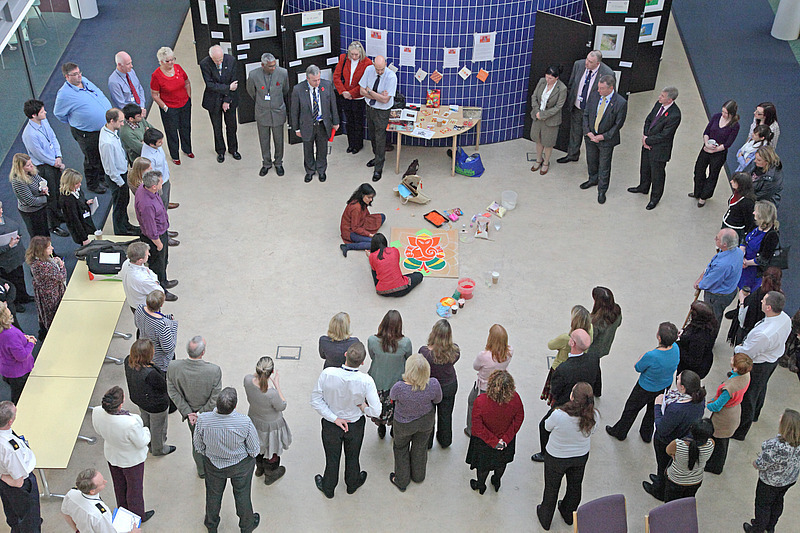 Staff at RSPCA HQ in Horsham observing the Rangoli in action. For a small investment, the entire organisation was able to build profound links with a large community and at the same time inspire and educate their members, staff and trustees. Diversity is a vast creative opportunity, waiting to be tapped – and NOT a threat or a nuisance, as many leaders sadly see it today, consciously or unconsciously. Practising diversity and inclusion creates multi-dimensional WIN-WIN opportunities for any organisation, where growth and progress results and everyone becomes a winner. Mr. Ashwin Soni (Crawley Hindu Temple), artist Binita Kateria, Mr. Gavin Grant (RSPCA CEO), artist Chetna Mistry and Atul Shah (Diverse Ethics) next to Ganesha, the Lord of protection. Sadly far too many organisations today approach Equality in the wrong way, and focus on legal compliance by using a minimalist approach, rather than invest in it as a growth and creative opportunity. Their approach is transactional rather than transformational. As a result, they pay a heavy price for this in terms of training and legal costs, including reputational damage through industrial tribunals. One of the key reasons for this is that the leaders often fail to see or understand the vast bottom-line benefits that ensue from true equality and inclusion. And the price of this, is borne by both organisations and society at large through inequalities and exclusive behaviours. The opportunity of diversity lies in opening hearts and minds, in harnessing innovation, in mitigating risk and removing complacency and group-think. It helps to lift morale, encourage ethical behaviour, promote organisational loyalty and build sustainability into the fabric of the workplace. For truly diverse and inclusive organisations, creativity and ethics become instinctive actions. And given the increasing globalisation of the world, employers can least afford to be complacent about the bounty of diversity. Leaders should directly engage with the diversity agenda and not delegate it downwards. A holistic approach is far more effective than a partial or siloed approach. It also saves a lot of money.